Notables from the 4/8/19 Finance Commission Meeting which is deep into the budget season. The proposed budget will be present to City Council on May 28th. 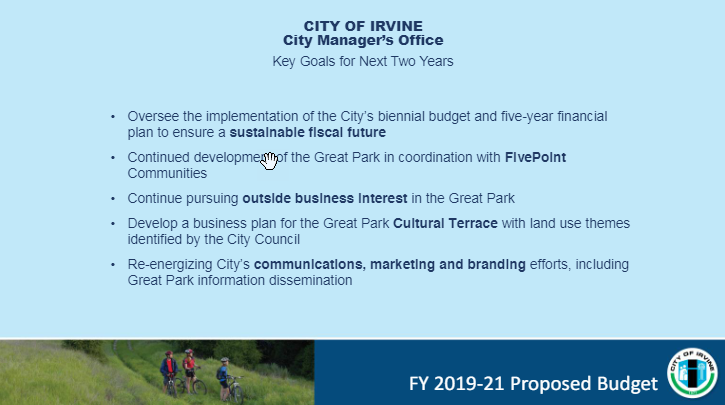 A new function: Economic Development was established that will focus on the Great Park and to attract more business to Irvine. The City’s communications, marketing, and branding efforts in social media, etc. are being retooled. A key deliverable for this department is to develop a business plan for the Great Park Cultural Terrace with land use themes identified by the City Council. Long discussion on the Great Park balloon and carousal operations and fee schedule. Discussion centered on the City seeking sponsorship/partnership opportunities and other cost recovery options such as fee increases and/or reduction in operating hours. Department recommends combining the best of both the Global Village Festival and the Spooktacular events for a 2-day event. Two key revenue drivers are the Great Park facility rentals (fields, stadiums) that generate $4.5M annually & Great Park tennis programs $1.0M annually. A high tech pavement management program that will improve the accuracy and conditions of the city roadway infrastructure. The use of goats for vegetation management was a big success. The goats will be back! Capital Improvement Projects (CIP)- $145M in projects for the 2-year budget cycle. Projects are in four improvement categories: Street & Mobility 56%, Great Park 29%, Facility 11%, Landscape 4%. Installation of 16 additional electric charging stations for a total of 24 citywide. Pilot “adaptive signal technology” on one major corridor and numerous signal synchronization projects. A trend is to move from new construction to neighborhood preservation. Two General Plan Updates are scheduled in 2019. Expenditure items are for technology investments for electronic plan submittal & review and to replace a legacy technology ($4-6M) that will become obsolete. The Eden replacement – it manages plan checks, permitting and inspection citywide. This department is requesting to hire 5 police officers and a police sergeant in 2019-20 and 4 police officers and 1 crime analyst in 2020-21. Proposed Key revenue generators: reinstate the business license fee and the addition of part-time parking officers.